Ninety-pound birds that once lived in South America wielded their giant, sharp beaks in quick jabs, much like the boxing tactics of Muhammad Ali, according to a new study. Originally dubbed terror birds because of their fearsome head, the flightless creatures were built to strike forward, attacking their prey with sudden jabs, researchers reported in the online journal PLoS ONE. In other words, while the birds couldn't float like a butterfly, they could sting like Ali. "These guys were not sluggers, they couldn't go in and grapple with prey. They had to stand back and dance around and make hatchet-like jabs," Lawrence Witmer of the Ohio University College of Osteopathic Medicine said of the birds, officially known as Andalgalornis. The design of their head "dictated what their killing style must have been. Attack and retreat strategy ... trying to kill the animal then swallow it whole, if they could, or use the bill and strong neck muscles to rip off chunks of flesh," he said in a telephone interview. The 4 1/2-foot tall birds lived about 6 million years ago in what is now northwestern Argentina. 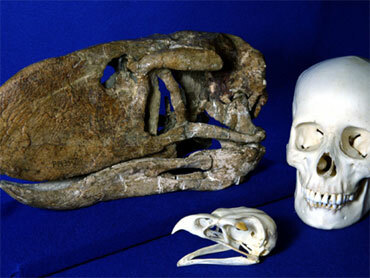 Its skull had a deep, narrow bill armed with a powerful, hawk-like hook. "Birds generally have skulls with lots of mobility between the bones, which allows them to have light but strong skulls. But we found that Andalgalornis had turned these mobile joints into rigid beams. This guy had a strong skull, particularly in the fore-aft direction, despite having a curiously hollow beak," said Witmer. An engineering analysis showed that the bird was well-adapted to strike with its beak and pull back, but would have been badly strained had it tried to shake prey from side-to-side. Also, its hollow beak could be damaged by hard sideways shaking. And while it's bite would not have been a quite as strong as that of a similar-sized mammal, it could compensate by using the beak like an ax, according to the researchers led by Witmer and Federico J. Degrange of Museo de La Plata in Argentina. The researchers were a bit surprised by the findings, Witmer said. The thinking going in was "these were pretty tough guys, and they absolutely were, but they had to be kind of careful," he said. "Being a predator is a really risky business. A prey animal is going to fight back." He said the researchers approached the study both anatomically and by using engineering to simulate potential behaviors. "The cool thing was we both came up with the same answer," he said. "And a surprising thing is we could figure it out ... and feel pretty good about it." Andalgalornis was one of a variety of different sized terror birds that lived in South America at the time. At least one larger type, Titanis, invaded North America, but the animals later disappeared. The research was funded by the U.S. National Science Foundation, the Australian Research Council, the Australia and Pacific Science Foundation and the National Fund for Scientific and Technological Investigation of Argentina.